Seven C's Unit 404 is located in a BRAND-NEW oceanfront complex, featuring direct beach access, a community swimming pool and wonderful ocean views. This unit is on the top floor of the south end of the complex with a large ocean front balcony. And you must try the captain's chairs on the balcony. The owners searched the island to find the most comfortable chairs made, and they found them. And relax in front of the 55 inch Hi-Def TV in the living room. You will enjoy movies and TV shows from your very comfortable seating, and there's NETFLIX, YouTube and Amazon through the DVD player. A dedicated, covered parking spot keeps your car cool all day, and an elevator makes loading and unloading a breeze with additional parking level storage you will find a breach umbrella and sand chairs for use. Step off the elevator and you are at your vacation home. All on one level, this very tastefully decorated and well-equipped condo includes a Queen master bedroom, a bedroom with 2 Twin beds is adjacent to full hall bathroom, and a Queen sleep sofa in living area. A lovely dining table with seating for 6 provides great ocean views while you eat. The large balcony offers stunning oceanfront views. It's a perfect way to cap off a day at the beach. Seaclusion is also equipped with its own washer and dryer. Need more than one unit? 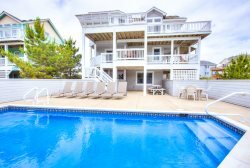 Additional Seaside Vacations homes in the same complex: TSC203, TSC301, TSC305 & TSC405. The property was clean, modern, and comfortable. The view from the main living area was wonderful and we especially liked the view from the master bedroom.